The “Whose Beloved Community? Black Civil and LGBT Rights” conference brings together LGBT and Civil Rights scholars, activists and other stakeholders to advance a more comprehensive vision of justice. 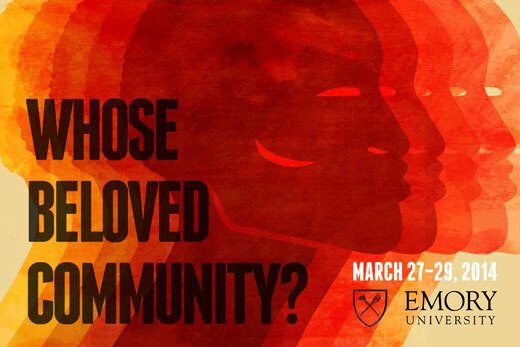 The first-ever international conference to examine the points of intersection and contention among the U.S. Civil Rights movement; the lesbian, gay, bisexual, and transgender (LGBT) equality movement; and black LGBT communities will take place at Emory University March 27-29. The "Whose Beloved Community? Black Civil and LGBT Rights" conference brings together LGBT and Civil Rights scholars, activists, policy makers, community leaders, and other stakeholders to advance a more comprehensive vision of justice. The event is sponsored by Emory's James Weldon Johnson Institute for the Study of Race and Difference, and the Emory Women's Center along with many other university divisions, and the Arcus and Ford Foundations. Atlanta and Emory are the ideal setting for the conference because of the history of the region and the university’s strong scholarship in African American and LGBT studies, say conference co-chairs Dona Yarbrough, associate vice provost for Community and Diversity and director of Emory’s Center for Women, and Leslie Harris, Winship Distinguished Research Professor in the Humanities at Emory College of Arts and Sciences. "The South has by far the largest concentration of black LGBT people in the United States, and Atlanta is at the center of that community, while also being the cradle of the civil rights movement," Yarbrough says. "It is absolutely undeniable that the LGBT rights movement has learned from the civil rights movement, as all subsequent equality movements have. The conference focuses on that connection, the ways that these movements are similar and different, and the role of black LGBT people in both movements." Scholars from more than 40 national and international universities, as well as leaders in the black LGBT community, will examine intersections of identity within the black LGBT community, including race, sexuality, gender identity and socioeconomic issues. "LGBT movements often have been criticized for not taking into consideration intersections of identity that are different from the mass media face of the LGBT movement, which is primarily that of white, affluent, gay men. Those intersections are really what this conference is about," Yarbrough adds. The conference also addresses misleading assumptions that African American communities are uniquely more resistant to LGBT civil rights than are other communities, says Harris. "The truth is that, as with any other community, there are an array of positions on the meaning of civil rights, in regards to race, gender, sexuality and class. And as with any community, these conversations are in process," says Harris. "We believe the conference is an opportunity to have several concurrent conversations and take a few snapshots of how a diverse group of academics, public policy professionals, activists, artists and community members understand the legacy of African Americans' struggles for civil rights, and how that legacy informs ongoing struggles for civil rights and equity for LGBT individuals and communities." A keynote conversation with civil rights leader Julian Bond, African-American lesbian social-justice activist Mandy Carter, and activist Alexis Pauline Gumbs, co-founder of the Mobile Homecoming Project, will open the conference at 7:30 p.m., Thursday, March 27 in Glenn Memorial Auditorium, 1660 N. Decatur Road. The keynote event is free and open to the public. Sessions will be held at the Emory Conference Center beginning on Friday, March 28 at 9 a.m. and will feature panels on topics including religion, scholarship, LGBT and civil rights history, marriage equality, activism and literature. On Saturday, panel sessions begin at 8:30 a.m. and the conference will conclude with a closing reception from 4-7 p.m.
Exhibit honoring the life and legacy of the late Rudolph P. Byrd, a renowned and influential professor at Emory and founder of the James Weldon Johnson Institute. To register and for more information, see the the conference website. The conference realizes a vision grounded in the work of the late Rudolph P. Byrd, founding director of the James Weldon Johnson Institute, longtime Emory professor, and scholar of American and African American literature, folklore, philosophy, gender studies and sexuality. Byrd pursued and received a grant from the Arcus Foundation to look at the points of convergence and divergence among the black civil rights movement, the LGBT rights movement and black LGBT communities. This conference is one of the primary outcomes of that grant. Before his death in October 2011, Byrd gathered national scholars with expertise in civil and LGBT rights for a working group to create a volume of essays on topics ranging from legal issues and scholarship to literary criticism and history and to develop the initial plans for the conference program. Upon his death, Harris and Yarbrough were asked to continue this work as primary investigators for the Arcus Foundation grant.